Illawarra Steelworks Pty Ltd offers quality commercial and industrial steel drafting, fabrication, and erection services for medium to large construction companies. This includes structural and general steel fabrication, posts and frames, welding, and rigging. Our trained steel construction project managers, engineers and welders are dedicated to providing quality structural steel fabrication and commercial steel design. Our qualified workshop personnel understand that precision is vital in welding, cutting, bending, cambering, drilling, marking and punching steel so that your job is correct to the finest measure. Our structural steel products range in size from 1 tonne to 200 tonnes; and we have the further advantage of having heavy lifting cranes from our subsidiary company, ACT Rigging and Crane Hire Pty Ltd.
We make balustrades and handrails in mild steel, stainless steel or aluminium, and all types of handrails and balustrades and are custom designed to suit customer requirements. 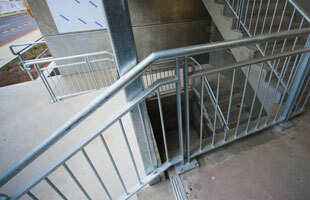 Steel staircases are often produced in tandem with balustrades and handrails. 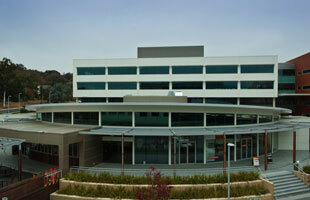 An example of this is the recently completed Canberra Airport car park spanning five to six floor levels. Staircases can be built to match all building sizes and structures. 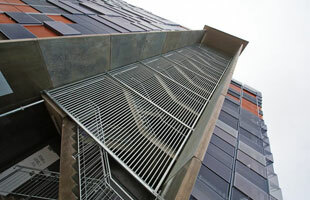 Louvers are produced to enclose plant or generators and air grills. Sunscreens are built to suit each construction need, and are installed on site. They are available in a range of styles and finishes. These are available in a range of surfaces for cricket pitches, nets and tennis courts. The surfaces include Rebound Ace, a sports acrylic surface giving an ideal combination of consistent bounce, sure footing, and market leading durability. They are also available in a synthetic grass range or a manufactured rubber surface (using reconstituted tyres, for example). 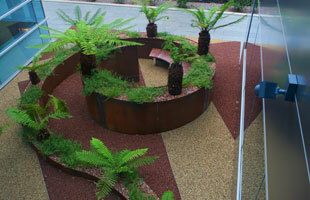 Illawarra Steelworks Pty Ltd can produce a wide range of design profiles using the Intec Waterjet Cutting System’s profile abrasive waterjet cutting system. 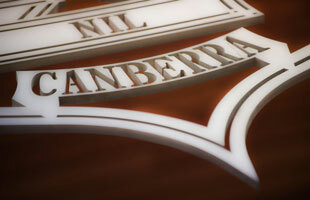 The waterjet can cut almost any material up to 150mm thick at maximum cutting speeds. This innovative system has many applications in construction and building design, and there are many reasons why waterjet cutting is preferable over other cutting methods. The flexible five axis head is capable of carving elaborate shapes out of 200mm thick stainless steel. This highly accurate machine was used to cut the intricate school insignia for Canberra Girls Grammar School from a plate of solid steel. The waterjet can cut to the limit of the table, 1.5 metres to 3 metres. In waterjet cutting there is no heat generated. This is especially useful for cutting tool steel and other metals where excessive heat may change the properties of the material. Unlike machining or grinding, waterjet cutting does not produce any dust or particles that are harmful if inhaled. The kerf width in waterjet cutting is very small, and very little material is wasted. Water cutting can be easily used to produce prototype parts very efficiently. An operator can program the dimensions of the part into the control station, and the waterjet will cut the part out exactly as programmed. This is much faster and cheaper than drawing detailed prints of a part and then having a machinist cut the part out. Water cutting can be easily automated for production use. Water cutting does not leave a burr or a rough edge, and eliminates other machining operations such as finish sanding and grinding. Water are much lighter than equivalent laser cutters, and when mounted on an automated robot. This reduces the problems of accelerating and decelerating the robot head, as well as taking less energy. 3 tier that seats up to 30 people. 4 tier that seats up to 40 people. 5 tier that seats up to 50 people.